There is no charge for these rides. If you thought all the great riding in the Jemez Mountains was lost in the fires, quess again. There is an abundance of riding opportunities waiting for you to come and check it out. This fall I am focusing on the mesas between Jemez Springs and the Rio Guadalupe. Next summer I expect to concentrate on the area between the Rio Guadalupe and the Sierra Naciemento north of the tunnels. After the picnic, some of us will go on a 15-20 mile ride. There will be another easy ride for the kids and wives while we are on the longer ride. This can be a two part ride with the first part relatively easy, if any want it that way. At about 5 miles, those who want a shorter ride can head back to the start on an easy road. The rest of us will continue for a longer ride total of 15-20 miles. Length up to the group. These rides will be to places we didn't get to last trip. Start Time: 9:00 MST Don't forget the time change. 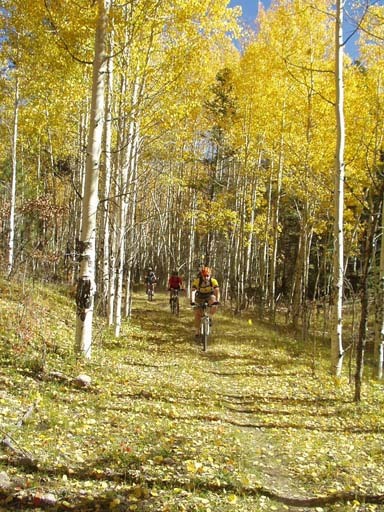 These will be the last rides in the Jemez for 2015. If you are interest in XC ski trips in the Jemez, let me know. We typically play mtb games, but you can just ride or practice/learn bike handling skills. What's is at the mazes? 41miles of cool single track ranging from easy to very technical-trialsin sections. map of the Maze (If the image is real grainy in your browser, expand it to full size. This map covers about 1/3 of the Old Maze. Arial Photo of the Old Maze - Email me if you are interested or for directions.